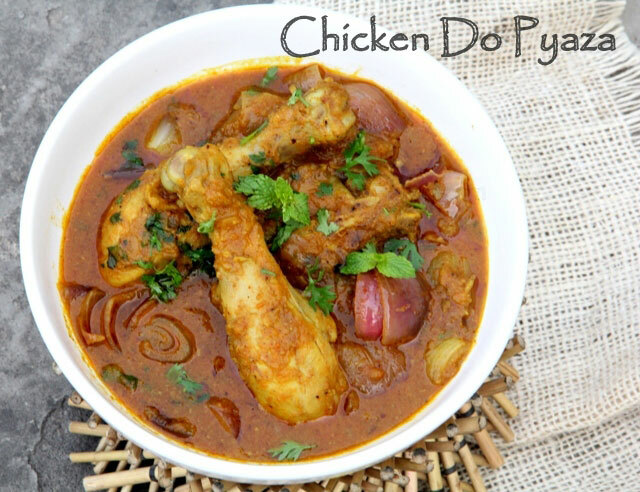 It is yet another of a traditional Indian classic Chicken recipes that one can’t get tired of eating. 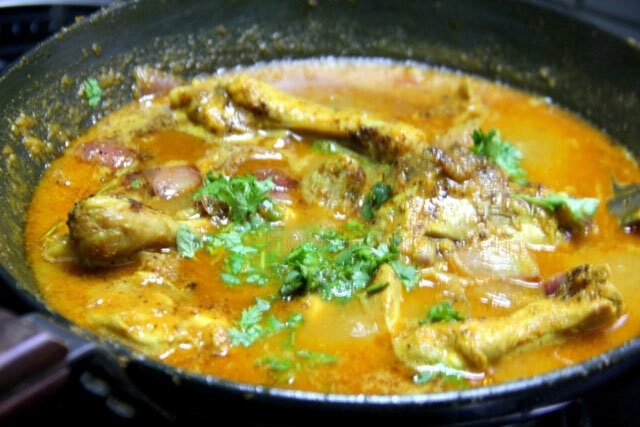 It is spicy blend that’s balanced out with the characteristic sweetness from the onions, slowly cooked into a thick curry. 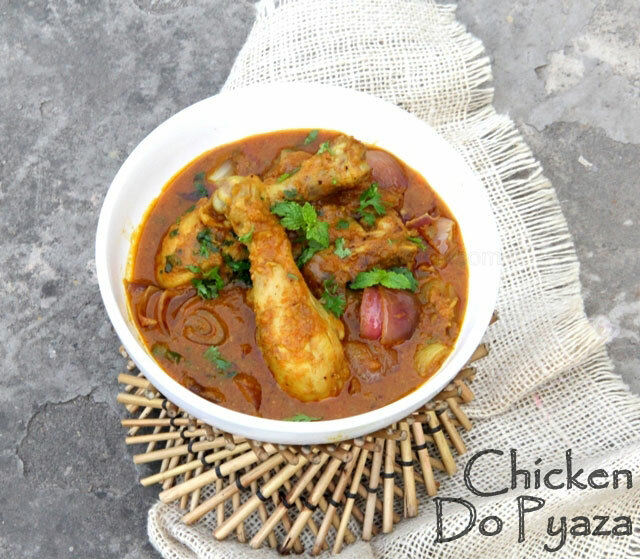 Essentially term ‘do-pyaza’ implies that onions are cut into two different shapes and added to the recipe in two stages. I however over the years have developed my own variation where I add onions at in three stages instead and I have reasons to believe that it makes a better curry after all. 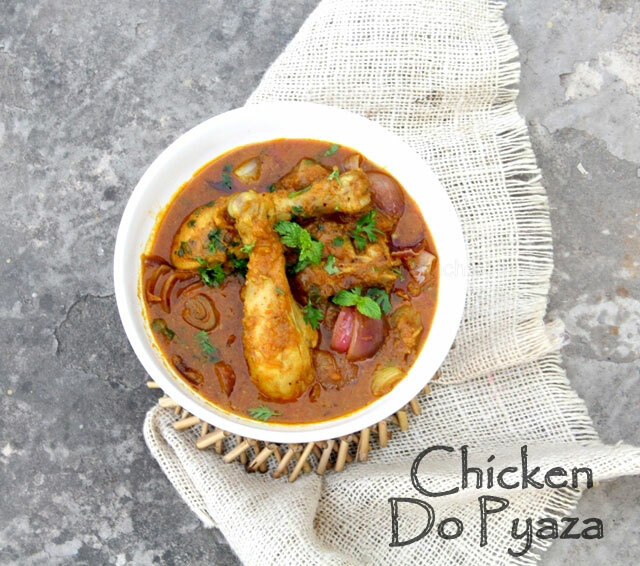 The chunks of onions in Chicken Do payaza add a certain crunchy character to the gravy that makes it absolutely special. You just need to try the gravy and you’d know what I mean. Most restaurants top it up with some fresh cream at the end, I in particular prefer it without the cream. 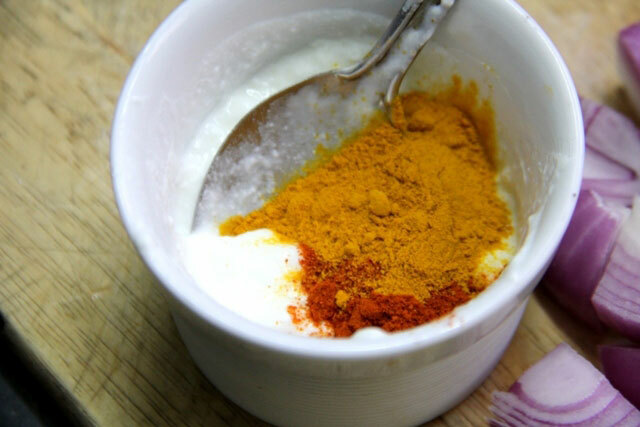 Please be warned that it is quite a spicy preparation, not outrageously hot though and if you prefer a milder curry do not hesitate to stir in 1-2 tbsp of fresh cream at the end. 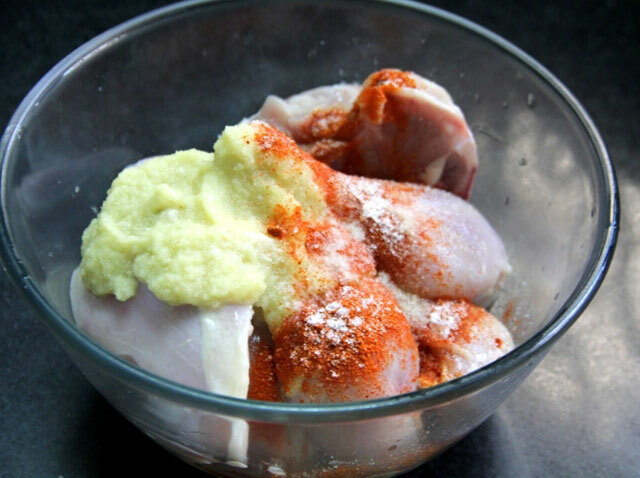 Marinate the chicken with ½ tsp red chilli pwd, 1/2 tbsp ginger paste, 1 tbsp garlic paste, a little salt and ½ tbsp mustard oil and keep aside. 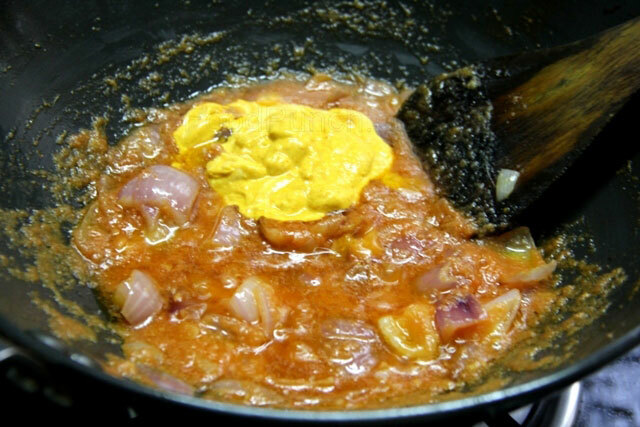 Heat 1 tbsp mustard oil and ½ tbsp oil in a kadhai or any deep pan, add the chopped onions and fry until it is browned drain out, allow to cool and then blend into a paste with 2 tbsp water and keep aside. In the same wok add the remaining oil and ghee and add the ginger and garlic paste, fry for a min. 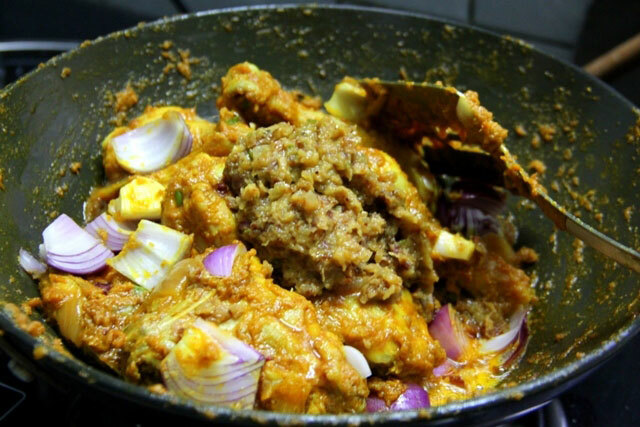 Then add half of the onion chunks, chopped green chillies and fry until it is browned. 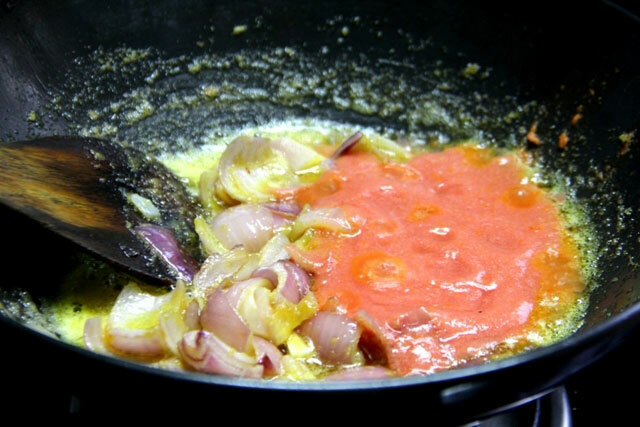 Then add the tomato pure, mix turmeric and remaining red chilli pwd with the curd and add to the wok. Add some salt and fry the spices for 4-5 mins on medium flame. Add the marinated chicken along with the marinade, the cumin and coriander pwd and fry together till oil stars to appear on the sides. 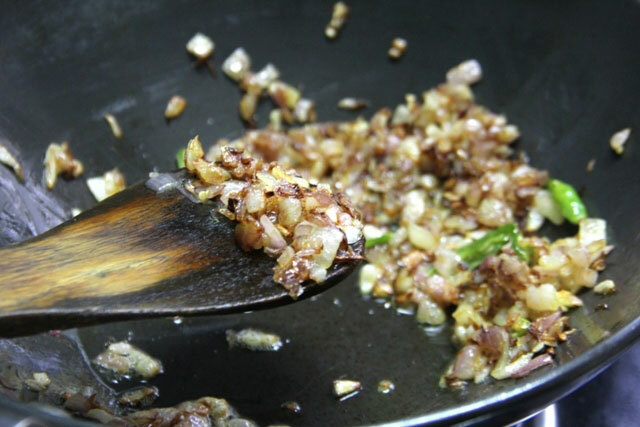 The stir in the remaining onion chunks and half the chopped mint-coriander leaves followed with the fried onion paste. Give a stir and top up with 4 cups of water. Cook until the chiken is soft and cooked through. 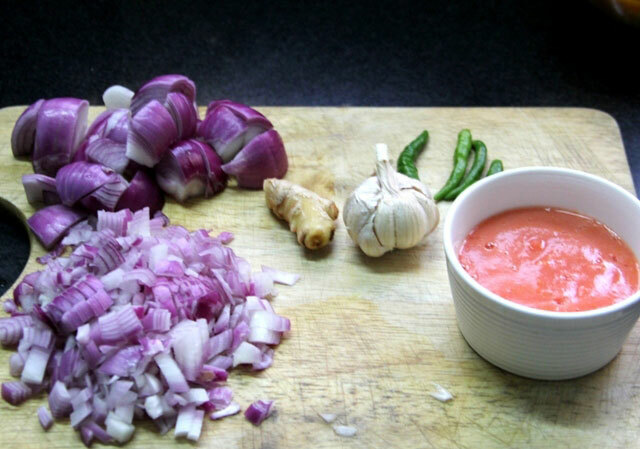 Reduce the gravy if required, adjust salt and stir in the pepper pwd and prepared garam masala pwd. 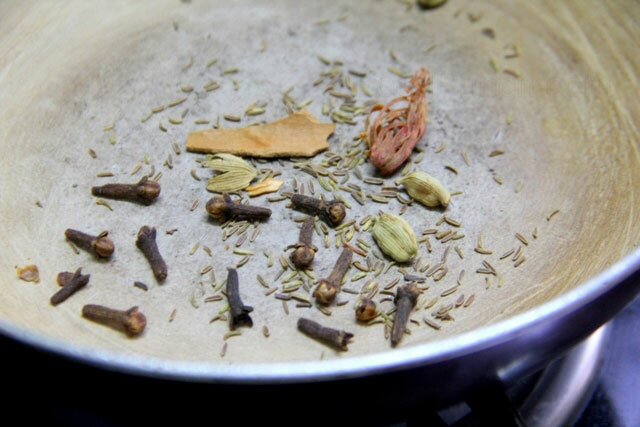 Garnish with the remaining chopped coriander and mint, serve hot with rice or Chapatis or Parathas. Add some kasori methi to the gravy if you like the taste. Adjust chillies to your liking and add some cream if you prefer a mellower taste. Very nice. I’m surely going to make this recipe this weekend! Thanks for this, I’ve made a close approximation with what I had on hand. This has inspired me to get the ingredients I never had and do it properly next time. 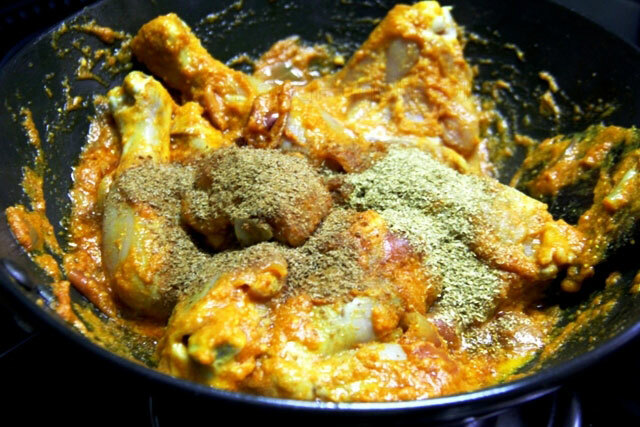 Wow…..This recipe is awesome,right now preparing it and the fragrance and aroma is already ravishing and mouth watering.Thanks.